On Sunday night I had a discussion with my better half about how many submissions I should be sending out at a time. “I’ll send more out.” I said. So, this week I’ve sent more out. Loads more. But I have always made sure that each agency is willing to accept unsolicited manuscripts and I’ve followed their submission guidelines to the letter. At quarter past one this afternoon I received the first rejection. This was from The Caroline Sheldon Literary Agency although I commend them on their speedy response, I curse them for their lack of speedy acceptance. Even though I didn’t, I thought I had a connection with Penny Holroyde because she’d rejected “Entering The Weave” eight years ago. The email I got was just a standard reply. Which is FINE. Honestly. No, really. It is fine. I understand that there is no point in spending any more time than is absolutely necessary on work that is not going to be accepted. But, although it was entirely standard, they still said that they “enjoyed reading my material”. This is politely encouraging and suitably vague which means that it can be used for almost any reply. That doesn’t help me, and, in the long term, I don’t think it actually helps the agencies, either. I’m sure many aspiring writers will hang onto the fact that this agent “enjoyed reading” their work, and hold it up as testament to their own skill, therefore prolonging the hope/agony when ruthless honesty would have been kinder and more helpful. I think they should be more structured. I propose that the next agents’ banquet they all get together and adopt a formal method of response which should include a rating out of 10 for how much they liked it or how close to accepting it they were. It wouldn’t take long to add that. And even if they really liked it and gave 10/10 they wouldn’t need to actually take it on. I understand how very few writers get to be represented. But a simple scoring system like this would be useful to everyone. If a writer was getting consistent 9s and 10s, then she’d know she was close; whereas if all the agents returned 1s and 2s he’d know there was something seriously wrong with what he was submitting, and he would know that the next thing he wrote would have to be different. It would also help the agents in the long term. Even the most stubborn writer would learn to target his audience and begin to submit to agents who were giving him higher marks, rather than submitting across the board. 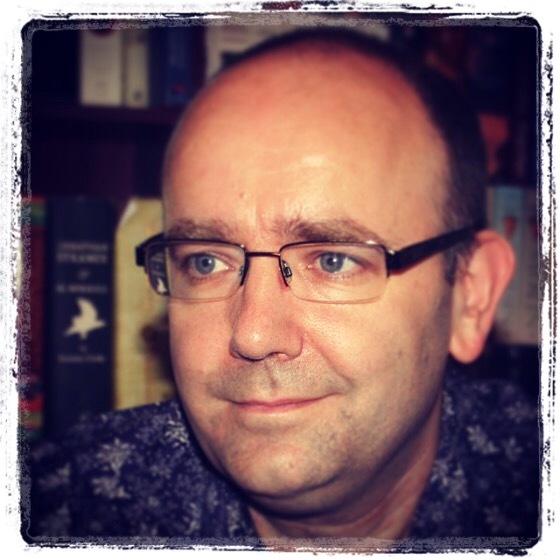 This entry was posted in Communications, The Clockwork Butterfly and tagged Caroline Sheldon Literary Agency, Literary agent, Penny Holroyde, Rejection, Submissions. So, Friday evening probably isn’t the best time for me to send submissions out because I’ve got to wait until at least Monday morning before anyone gets to read anything. So I’m almost certainly making life more difficult for myself, by giving myself a whole weekend to fret about everything without an iota of a chance that anything’ll happen… This will not stop me from checking my emails regularly though, just in case someone creeps back into their office to do some moonlighting. One of the most promising rejections I got from “Entering The Weave” was from Sarah Manson. So I picked her agency as one of my three. Looking at the website though, I was disappointed to see that they were not accepting new submissions. So rather than submitting anything I thought I would introduce myself. I’m just starting the long process of submitting my second novel for consideration and as part of my research I’ve looked through all my previous correspondence to see if there were any in particular that seemed more hopeful or personal than the standard rejection slip. And although you rejected my submission at the time, you gave me some handwritten feedback which was most appreciated. 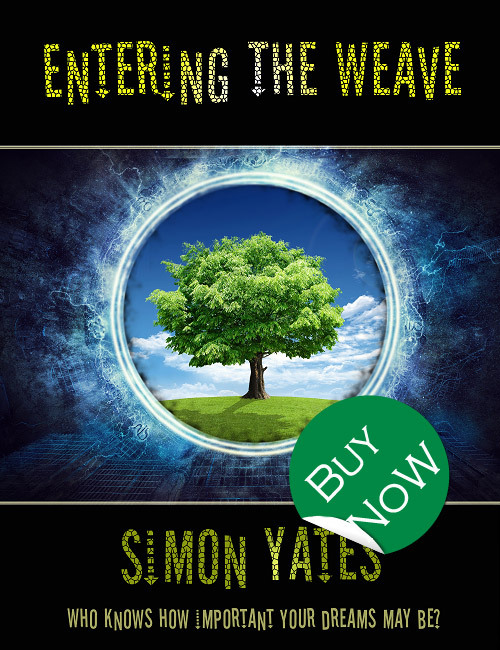 “Entering The Weave” was eventually picked up by Anne Dewe at Andrew Mann Ltd, and I thought I’d really made it then. But the publishers thought otherwise and so it was never released upon the unsuspecting world. It took me some time to get over it, but I started working on a new novel soon after and now, finally I’ve finished. I checked with your website and you unfortunately it says that you’re not accepting new unsolicited material. So I thought a short(ish) introduction might turn the unsolicited into the solicited… Would you mind if I sent you my new novel? It took some time to compose this, and I thought it was succinct enough, that it might just tickle some interest. I sent it at 5:19. Sorry, I’m not taking any submissions. Good luck! This implied a proper read of the material and the fact that Penny had been kind enough to give some tips on improvement as well as saying “it’s promising but not quite ready yet” was decidedly encouraging. The Caroline Sheldon Literary Agency is always looking out for exciting projects by début authors in both adult and children’s books, but out of the enormous amount we see, we select very few. On occasion we do make detailed editorial suggestions and comments but we only do so when we see real promise in the work. Lacklustre submission emails including little information about yourself or your work. This is your opportunity to pitch your book—use it. Humorous submissions that aren’t funny. Proposals for fictional novels – what other sort are there? Submission emails without representative material to read attached. We want a one hit submissions process – to read about you in your email and to read your work immediately afterwards. Query emails, telephone calls or letters about what we want to read from unpublished authors. We welcome submissions but we want to read your work, not engage in phone calls or correspondence. We think all the necessary information for submissions is included in this website. An invitation to follow a chain of website links to find your work. Please don’t make us have to dig it out – the delete button beckons. Artists’ submissions of original work. We much prefer an email submission with attachments or a link to your website (a link to a website is an easy way to view work but please don’t make us trawl through a complicated string of links to get there). Inclusion of non-consecutive chapters e.g. 1, 13 and 26. Always send the first three. If you’re not confident in them, revise before sending out. Picture book submissions that state everything depends on the illustrations. The words are what you are supplying—if it all depends on the illustrations, why are you necessary? Submissions that are obviously carpet-bombing the whole of the Writers’ and Artists’ Yearbook. We don’t love the ‘send all’ approach. Please find attached the first three chapters and a synopsis of my novel “The Clockwork Butterfly” for your consideration. This is my second YA novel and the second time I’ve submitted to the Caroline Sheldon Literary Agency. You, personally, rejected my first submission, “Entering the Weave” but you explained your reasons and you were very encouraging about the imagination and accessibility of the novel. “Entering the Weave” did eventually get taken on by Anne Dewe at Andrew Mann Ltd, but she couldn’t get it published and I think that led to her retirement. I don’t have any professional writing experience, but I am an ardent lover of books. I’ve never forgotten the sense of wonder I felt when I read my first Diana Wynne Jones (The Power of Three). More than anything, this novel is an attempt to recreate those feelings for my own children. “The Clockwork Butterfly” is a pure hearted fantasy story about a young girl who travels to another world where she is drawn into an ancient struggle against an eternal evil. 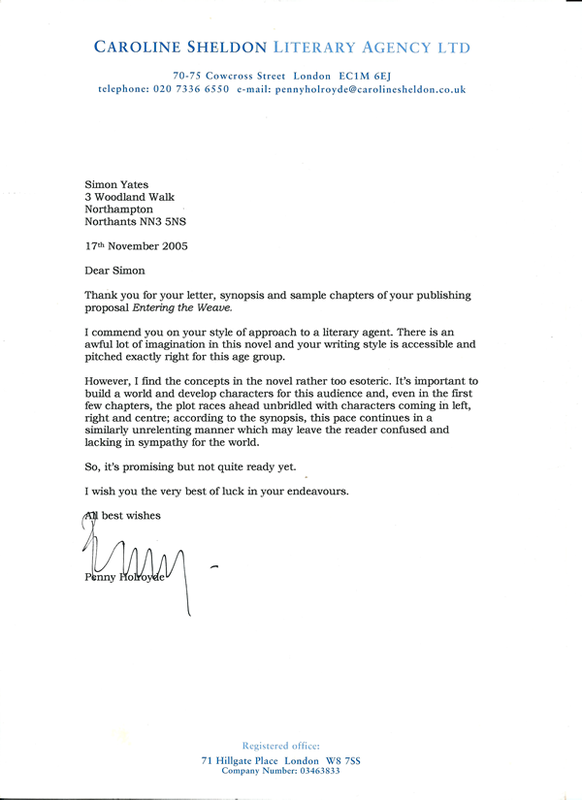 I received a fairly standard rejection letter from Gillon Aitken Associates when I sent them “Entering The Weave”, but it was printed on nice, yellowish embossed paper and they did say that it was “an interesting idea, fluently written”, and their website implied an openness to new submissions and an almost terrifying professionalism. This is my second YA novel and the second time I’ve submitted to Aitken Alexander Associates (although before it was Gillon Aitken Associates) My first submission, “Entering The Weave” was rejected but Kate Shaw said (as she probably did to everyone) “It’s an interesting idea, fluently written…” It went downhill from there. “Entering the Weave” did get taken on by Anne Dewe at Andrew Mann Ltd, but she couldn’t get it published and I think that led to her retirement. So, how could I not choose you? And you looked the kindest. “The Clockwork Butterfly” is a pure hearted fantasy story about a young girl who travels to another world called Lyonesse. I’ve emailed them, asking for clarification about what’s supposed to happen at the end of the submission process and until then I won’t send it again. I got a completely standard rejection letter from this agency the first time, but when I looked them up on line I was impressed by how easy they’d made it for unpublished writers to submit their work. And they even have a special email address to send to for children’s/YA submissions. This entry was posted in Communications, The Clockwork Butterfly and tagged Aitken Alexander Associates, Caroline Sheldon Literary Agency, Darley Anderson, Gillie Russell, Literary agent, Penny Holroyde, Sarah Manson, Submissions.